When my husband and I first decided that we would go to Paris through London I immediately had two thoughts: Mamma Mia and Fish and Chips. 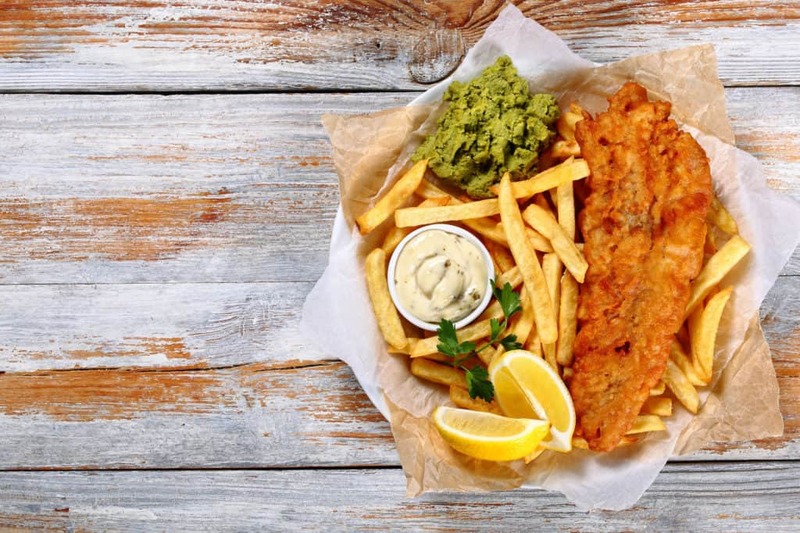 Growing up, every time London was mentioned, my grandfather would talk about the fish and chips, praising the food non-stop. He had spent time in the UK during WWII and always remembered the fish and chips fondly. When my sister graduated from high school in Spain, my grandparents decided to do a big trip to Europe which included visiting my family for my sister’s graduation in Madrid and a trip “home” back to Portugal and the Azores Islands where my grandparents are from. And of course, since it had been 45 years since he had been in London, my grandparents went there as well. Basically they went to London so that my grandpa could reminisce and eat fish and chips! Being Portuguese, my grandfather is very passionate. And the thing he is most passionate about is my grandmother. They were truly one of “those” couples, always holding hands, always together, always laughing and giving each other little kisses. They were so in love. My grandpa’s health was weaker, he had had a heart attack, had a pace maker, had problems with his legs. My grandma had her own health problems, but she was the “strong” one. We always said that if something happened to my grandpa, she would be ok, but if something happened to my grandma, my grandpa would quickly follow her. We were wrong. My grandparents were huge baseball fans, Oakland A’s. They had season tickets and went to all the games, my grandpa had even worked at the Coliseum a few years post-retirement. During one game in 2002, my grandpa was exiting the bathroom when someone much younger and stronger went through the exit and knocked my grandfather over, badly. He broke his leg and hip and there were lots of other complications. He was in the hospital, he almost did not make, but somehow he did. And at that moment something changed in my grandma forever. Dementia hit and then Alzheimer’s. And it got worse and worse. My grandfather was devastated, he had bought a new RV and they were going to tour the U.S. again (they had already done it before), she was the strong one, the one that was the rock. I moved to Europe and heard the rumblings from afar. My grandfather was adamant about taking care of my grandma, he would not be separated from her. Eventually she was and she continued her downward spiral. When I came back to the U.S. I could not bear to visit her. That was no longer my grandmother, the fiery, vibrant lady who I loved so much, it was a shell of a woman who could no longer talk and did not know who anyone was. I wanted my memories of my grandmother to be frozen in time, the saucy redhead you did not mess with. When she died, I could not bear to see her casket, I was at the burial, but could do no more. During all that time, my grandfather got worse. He became a bitter, broken man who suffers from dementia and is mad at the world for taking his wife away. I cannot bear it. I visited a few months ago, but cannot bring myself to do it more often. I want my memories to be the good ones, the good years. I am selfish. I am a fair-weather granddaughter. I want only good memories and cannot bear the reality. So instead, I pay tribute. I went to London. I had fish and chips. I thought of my grandpa. And I sent him a postcard telling him that I had fish and chips just for him and that I loved him. sorry some druel hit the keyboard! I just teared up reading this. This was such an honest post and I loved that. That is such a wonderful story about your grandparents. It also speaks to how much food affects our memories. I have fond memories of helping my grandmother make fried chicken and apple pie. I would shake the chicken parts in a brown paper bag filled with flour…She would say "Baby if you peel me some apples, grandma will make you a pie". No apple pie or fried chicken has ever tasted as good. I remember when I first tried fish-and-chips. I was in this phase, growing up, when I would try foods if they sounded good. I started with all of the different flavors at an ice cream shop. One evening my family and I went to a cafeteria-style sit-down restaurant. I ordered the fish-and-chips, and have loved it ever since!